T4 DNA Polymerase catalyzes the extension of a primed DNA template in the 5' -> 3' direction. This enzyme exhibits a powerful 3' -> 5' exonuclease activity, while lacking any inherent 5' -> 3' exonuclease or strand displacement functions. 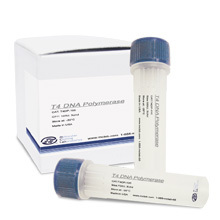 Purified from a strain of E. coli that expresses the recombinant T4 DNA Polymerase gene. One unit is defined as the amount of enzyme that will incorporate 10 nmol of dNTPs into acid-precipitable material in 30 minutes at 37°C. 1. Tabor, S. and Struhl, K. (1989) In DNA-Dependent DNA Polymerases. F. M. Ausebel, R. Brent, R. E. Kingston, D. D. Moore, J. G. Seidman, J. A. Smith and K. Struhl (Eds. ), Current Protocols in Molecular Biology, pp. 3.5.10-3.5.12. 2. Sambrook, J., Fritsch, E.F. and Maniatis, T. (1989) Molecular Cloning: A Laboratory Manual, (2nd Ed. ), 5.44-5.47. 2. Dale, R., McClure, B. and Houchins, J. (1985) Plasmid, 13, 31-40. 3. Kunkel, T.A., Roberts, J.D. and Zakour, R.A. (1987) R. Wu and L. Grossman (Eds. ), Methods Enzymol., 154, pp. 367-382. San Diego: Academic Press. 4. Panet, A., van de Sande, J.H., Loewen, P.C. and Khorana, H.G. (1973) Biochemistry, 12, 5045-5050.